Syrian rue, Peganum harmala, is a plant that since old times is used to increase the effects of psychedelic substances. Peganum Harmala is a Mao inibitor. 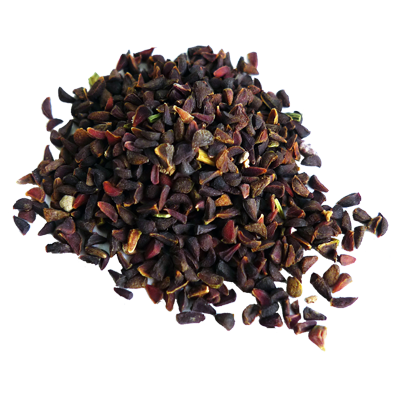 The Syrian Rue Seeds can be chewed or can be ground and mixed in a drink. Syrian rue is often planted close to buildings to keep out the “Evil Eye”. 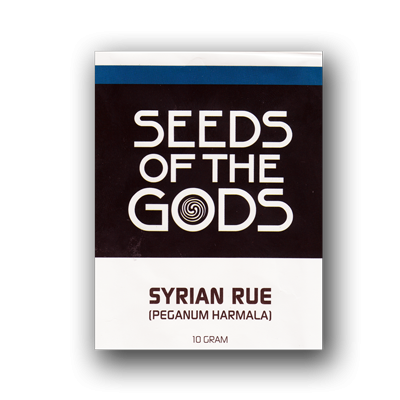 Contains 10 grams Syrian Rue seeds. In hermetically sealed packaging. It is commonly agreed that 3 grams of Syrian Rue is a sufficient dose when using it as an MAOi. Take the seeds about 15 to 60 minutes before consuming the other psychoactive substance. The effects of Syrian Rue last approximately 3 to 4 hours. There are different methods of consuming Syrian Rue seeds. In principle, it’s possible to eat the Syrian Rue seeds. You can take the seeds orally, carefully chewing them about 30 seconds before swallowing them. You can also pulverize the seeds with a mortar and pestle and use the powder to fill gel capsules. You can also choose to create a hot water infusion with Syrian Rue seeds. This method is slightly lighter on the stomach. Use approximately 3-4 grams of Syrian Rue seeds with 200 ml of water and 50 ml of lemon juice. Finely grind the seeds and let the powder simmer in water for about 30 minutes. Then sieve the tea and drink it. Syrian Rue is rather notorious for being difficult to cultivate. It’s a perennial plant that is found in warm, fairly dry parts of Southern Europe, the Middle East and South Asia. The plant is not so suitable for cultivation in the mild sea climate of Western Europe, but it’s possible if you grow it inside. Sow the seeds in late spring in a mixture of soil and plenty of sand. Be wary of overwatering. Place the pot in a sunny spot and make sure the temperature exceeds 20°C at all times. After a few weeks, the seeds should germinate and if it’s warm enough you can move the pot outside. Syrian Rue in combination with Cubensis Cambodia… Wow! I tried 2,5 grams of Syrian Rue with 2 grams (dried) Cambodian shrooms together with a friend. First we grained the seeds in a mortar and filled some capsules using the Capsule Machine. This allowed us to easily swallow the Rue and avoiding the horrible taste. I highly recommend this method! After taking the capsules we waited for about an hour. We both experienced no stomach issues or sickness at all. I felt a little drowsy and dizzy but nothing unpleasant. According to my friend it felt like being tipsy. Now it was time to take our shrooms. Normally we take 4 grams for a great trip but, with the effect of the Rue in mind, we decided to take only 2 grams (dried). The upcoming for me wasn’t very comfortable. Maybe it was because I didn’t know what to expect. I noticed a very strong ‘buzz’ in my body, probably caused by a higher blood pressure. I thought maybe this wasn’t a good idea after all. My friend had little physical issues and experienced the trip as more ‘Devine’ compared to regular mushroom trips, calling it 'a God Experience'. Physically, the only discomfort I experienced was the feeling of having a bowling ball in my stomach. No sickness however. The entire trip took about 8 hours with a high plateau of about 5 hours and a relaxed come down of 3 hours. I’m definitely interested in trying this combination more often but not for every mushroom trip. I do like the extended duration of the trip and the fact you only need half the amount of shrooms to get an even more intensive trip out of it. This is particularly handy when using shrooms that are very difficult to grow or give limited yields. I don’t recommend this combination to people with no or limited mushroom experience. Try just mushrooms first for a few of times before moving on combining it with Syrian Rue. According to many sources (including Wikipedia), Syrian Rue contains mostly MAO-A inhibitors which doesn’t stop your body from breaking down tyramine like MAO-B does. This is good news as you don’t need to avoid foods and drinks containing tyramine when using Rue. However: since Syrian Rue may contain a little MAO-B, it is still advisable to take it easy on tyramine-rich foods and drinks such as (aged) cheese, wine etc. Google will be more than happy to tell you which foods and drinks contain tyramines. Ne connaissant pas ce produit, j'ai pris 1g de peganum avec 1g de champignons mexicains, pour commencer doucement. J'ai mis de l'eau chaude (directement du robinet) dans un bol, couper les champignons en petits morceaux et les y ai ajouter, le peganum aussi, et j'ai laisser infuser pendant 5min. J'ai bu le tout en mâchant bien les morceaux. 10min après les sensations ont commencer, pour être à leur paroxysme au bout de 30. Net als marco heb ik 3 gram fijngemalen zaden een half uurtje tegen het kookpunt geroerd in ongeveer 300 ml water en 50 ml citroensap. Daarna gezeefd en achterover gegooid want proeven is de moeite niet waard. Na 1 uur heb ik zo'n 25 gram verse mexicaanse zelfkweek genomen. Voor de vergelijking was het wel goed dat er nog 4 mensen waren die dezelfde hoeveelheid paddo's namen maar zonder wijnruit. Waar de rest een redelijk milde trip had lag ik op de vloer heftig te trippen. De meest passende manier om het te omschrijven is een gewone paddotrip maar zonder remmen of vangnet. Probeer geen weerstand te bieden, het helpt niet. Just go with it zoals met elke trip. Ik heb op voorhand veel nagezocht over de waarschuwingen voor te hoge bloeddruk als je de wijnruit combineert met voedsel dat een bepaalde stof bevat (naam vergeten...harmeline ofzo). Hoewel de waarschuwingen niet voor niets zijn moet je dit allemaal niet te zwaar nemen. Het is vooral belangrijk absoluut niet te combineren met medicatie of extreem hoge doseringen van de te vermijden stof. Je kan op voorhand gewoon bijna alles eten. Ik heb ze gecrusht met een vijzel, toen 3 gram in koud water 24 uur laten trekken, dat 3 kwartier voor de trip op een lege maag gedronken..